In part to evoke that more leisurely relationship with time, La Montre Hermès this year has revived the look of those single-hand timepieces with a new watch that briefly transforms, at the touch of the crown, what appears to be a one-hand timepiece into a two-hand timepiece. On the dial of the new watch, called Dressage L’heure Masquée, (French for time veiled) the wearer sees only a lone minute hand unhurriedly traversing the dial much like the single hands on those centuries-old timekeepers. It will circle the dial once every sixty minutes. But when he or she touches the crown, an hour hand quickly appears, showing the time as is expected on any modern watch. When the user releases the crown, that hour hand disappears once again directly behind the minute hand. This effect allows the wearer to experience time at a more leisurely pace. More importantly, it offers the wearer only short-term-entry into the work-a-day rush that might actually require an hour and a minute hand. During the remaining hours, and days, the wearer can enjoy the watch as a beautiful work of art that won’t try to convince him he’s late for something. And this is exactly what Hermès wants Dressage L’heure Masquée owners to experience. 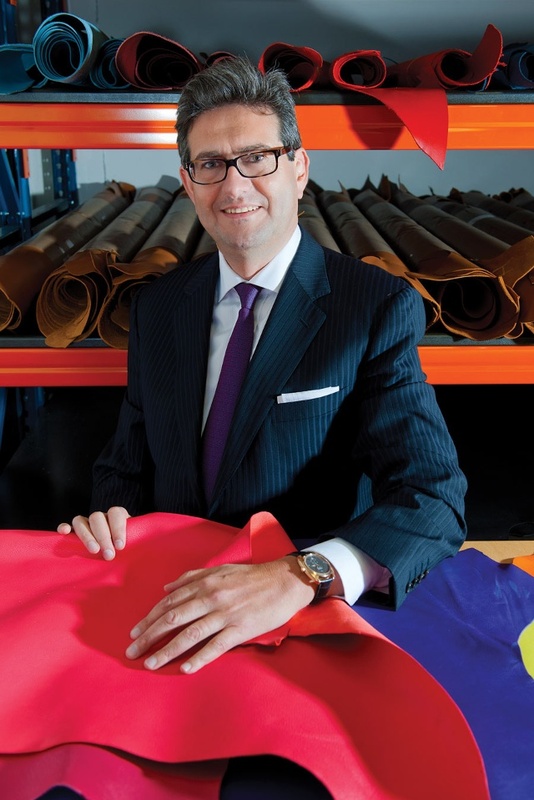 Here we are not in the arena of pure performance, timekeeping and accuracy, explains Luc Perramond, La Montre Hermès CEO. We are in a more poetic field where our goal is to make our clients dream and be enchanted. 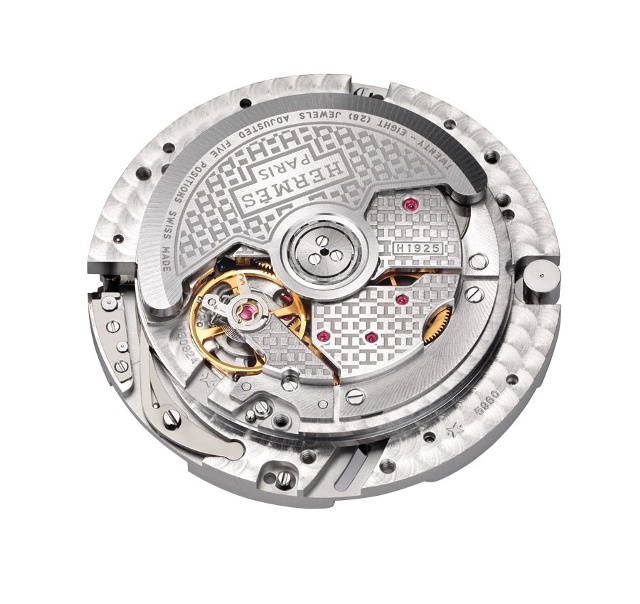 The techniques we developed with our watchmakers are dedicated to those poetic values. This new watch is not the first Hermès timepiece to play with the perception of time. Five years ago the company created the Cape Cod Grand Hours collection. These watches displayed time at a faster or slower pace at different times of the day by speeding or slowing the hour hand. Thus, the hour hand seems to move slowly during hours one prefers to enjoy, while it skips quickly between hours of work. 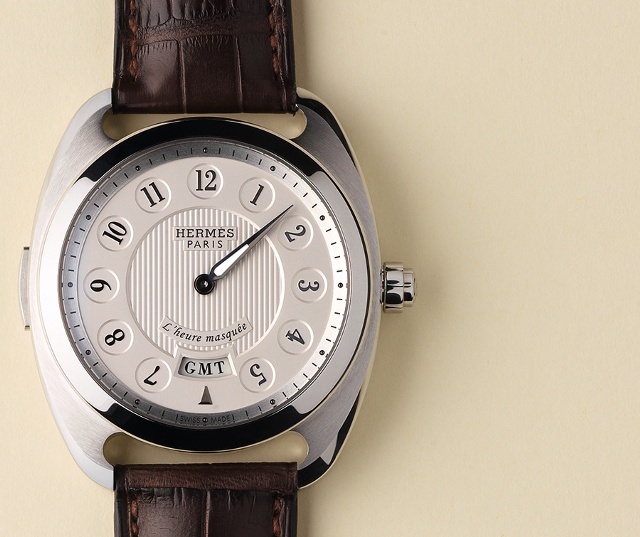 On the sold out Grand Hours models, the minutes and seconds continue to tick at the traditional pace. Three years ago Hermès debuted the Arceau Time Suspended watch that actually allows the wearer, at the push of a button, to make the date hand disappear while simultaneously halting the progress of the hour and minute hands. This is when the wearer can begin dreaming, Perramond explained at the debut of the Arceau Time Suspended. As his watch will not betray the passage of time while in the suspended mode. You can stop for three minutes, three hours or three days, and later on you can bring it back to the actual time whenever you want. And finally, last year Hermès added a smaller, 38mm, Time Suspended but with yet another twist: the small seconds rotates in reverse and fully rotates in twenty-four seconds rather than in the traditional sixty seconds. The idea was that even if you suspend time, the heart of the watch is still beating, Perramond adds. We are still recording time all the time. The new Dressage L’heure Masquée, set for debut during BaselWorld 2014, starts with the same suspending time philosophy, and modifies the functions once again. Masquée means that with this timepiece you can look for the time whenever you want to, he adds. Like the Time Suspended models, the new watch requires the wearer to interact with his watch. It’s kind of a mirror effect with the time. With the Time Suspended you could try to escape from the time and lose the notion of time by pressing a button. Here, you are going to look for information. In addition to the hours and minutes, the new watch will also quickly display the hour at a second time zone chosen by the wearer. In its ongoing mode, that second time zone window indication is hidden under a closed GMT shade at the 6 o’clock location. When the wearer presses the crown to expose the hour hand, which snaps into the correct position instantly from underneath the minute hand, the GMT shade disappears, exposing the digit that represents the hour at the second time zone. We felt it was important to add this useful function, which adds some complexity to the movement: a GMT function, adds Perramond. The inspiration for L’heure Masquée can be seen in historical regulator clocks and watches. Used in watchmaking workshops, these regulator dials, usually on clocks, featured large minute hands so the watchmakers could see them from their benches to set and check the time during the workday. We are not calling this a regulator, but that was Philippe’s (La Montre Hermès Artistic Director Philippe Delhotal) inspiration for this piece, explains Perramond. Delhotal and La Montre Hermès watchmakers worked closely with Vaucher, the high-end movement making company co-owned by Hermès, to design the new caliber inside L’heure Masquée. The module features two cams that essentially control each hand. One is a one-hour cam that completes a full cycle each hour (minute hand) as the twelve-hour cam rotates twice per day and controls the hour hand. Vaucher developed a rack that, when the crown is pressed, engages the hour hand, which immediately springs into action on the dial. Users press the button on the left side of the case to set the second time zone. Since the GMT window remains shuttered, the user must also press the crown if he or she wants to see the GMT hours rotate, one per click, during the setting procedure. 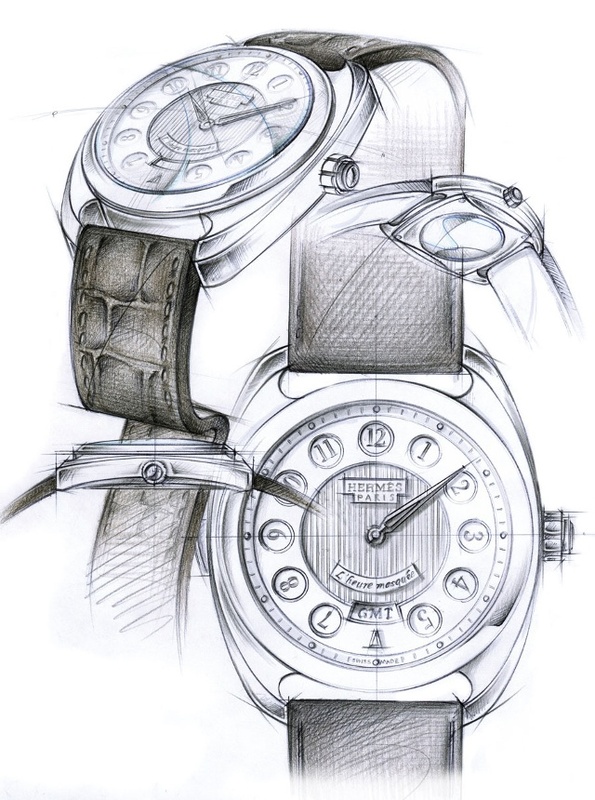 Technically, L’heure Masquée required numerous novel watchmaking techniques, and Hermès has a patent pending on the design, says Perramond. This module, he notes, requires ninety-five parts compared to the 168 components required to make the Time Suspended module operate. Interestingly, it’s still a pretty thin mechanism because we wanted a normal Dressage watch, which is elegant and thin, he adds. We wanted to keep this elegance. Indeed, the module is only 2.7mm thick and the entire watch only 6.4mm thick, which measures thinner than the Hermès Dressage chronograph that debuted last year. Both Dressage cases are cushion shapes that measure 40.5mm by 38.4mm. It’s a technique of technical achievement, Perramond continues. Instead of piling components on top of each other, we fit them together like a puzzle to keep it thin. A simple object is very complicated to manufacture. Unlike the previous poetically directed timepieces from Montre Hermès, the L’heure Masquée is being made as a limited edition of 1,500 pieces total; 1,000 will be made in steel and 500 in rose gold. 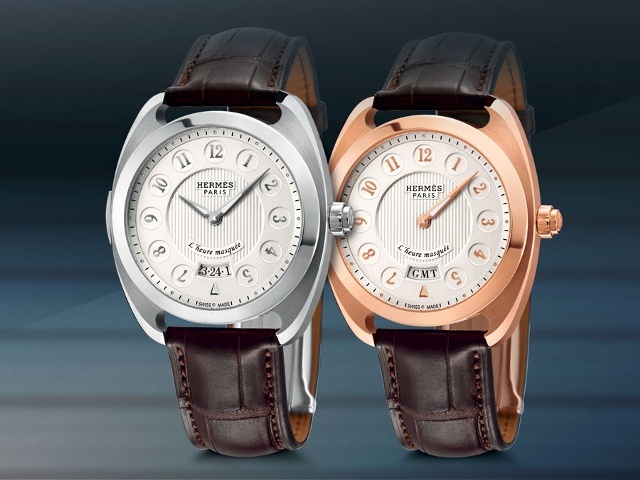 Prices: $44,000 for the rose gold edition and $19,500 for the steel model.